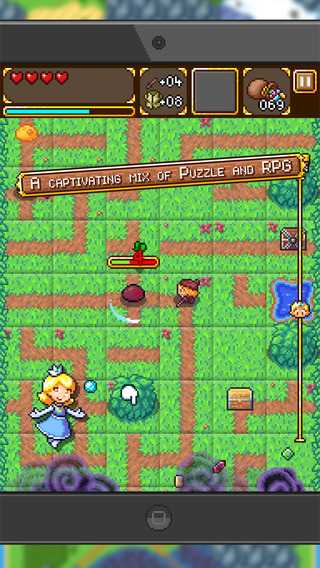 Tile Quest is a slick little hybrid puzzle RPG that uses a tile-swapping mechanic. You have to form a continuous path to allow your character to reach enemies, chests and so on (a bit like pipe-linking games). There’s an adventure mode and an endless mode. The adventure mode is unfortunately very linear, you can’t retrace your steps and revisit earlier areas, which is a bit of a shame. Though you can of course later replay the game a pick a different path. There are bonus areas which feel kind of like sidequests, where you have to solve more specfic puzzles with a bit more challenge to them. I gave up on the avoid-trap ones as you need quite a bit of coordination and timing for that. Most were great fun though and not overly challenging. Swap Quest is a very fun game and definitely one to pick up, particularly if you like vertically-oriented apps.